In the middle of the 19th century, the British Empire ran into a trade deficit problem with China. English demand for Chinese tea and silk had continued to grow and England had little to trade back to China in exchange other than silver. I should point out that the British did have military technology, modern rifles, ships, and artillery they might have traded, but did not offer it. Instead, Britain exported opium, grown and processed on the Indian subcontinent, its most successful colony, and shipped it to China. When the Chinese resisted and attempted to ban the drug, the British used their superior military strength to force open Chinese ports. The result was not one, but two Opium wars in which the British Empire not only sanctioned the drug trade, but used its armies to protect it. The second Opium war ended in 1860, the first year of the American civil war. One impact of the Opium wars was that it diverted British patrols to police the slave trade out of Africa. Throughout the American Civil War, the British quietly though never openly supported the Confederacy. Travis Hanes and Frank Sanello’s The Opium Wars is a detailed re-examintion of the Opium Wars from a twenty first century American perspective. While Hanes is a professor at the University of Texas, Sanello is a journalist and the narrative largely splits the difference with a mixture of standard elements from traditional histories like economic statistics and detailed battle descriptions framed with novelistic descriptions of the sacking of the Emperor’s Winter Palace and sympathetic portraits of the Chinese Official Lin who attempted to address the drug problem from all angles and William Gladstone’s moral opposition to the war (though he later tolerated it). The authors claim that this is one of the first Western histories of the war that includes more Chinese sources, but there’s little direct evidence of that in the narrative though its perspective is clearly sympathetic to the Chinese. As with most historical matters, I thought I knew more about the Opium Wars than I actually did. These were some of the items in the book that resonated for me. 1) Just how much of the Chinese population at all levels became opium addicts. The Empress Dowager who begins to come to power towards the end of the second opium war was an addict (though they believe a well-managed addict) throughout her reign. Fwiw, the last fifteen years have brought on a number of revisionist takes on her rule that paint her in a more heroic, but still flawed light. The authors describe a culture where the military and political leadership is debilitated by the drug. At one point, a Chinese man is chosen by a group of European missionaries to lead efforts against the drug and he too turns out to be an unrepentant addict. 2) The battle descriptions are hard to read, especially if you happen to be Chinese. They largely describe a conquistadors vs. Incas mismatch between modern military technology vs. numerical superiority and inferior weaponry and tactics. Most every battle ends with three British fatalities (most of the troops are actually Sepoys) and 700 Chinese killed. One popular misconception is that the Chinese armies fought only with spears and bows and arrows. The Chinese did have cannon and muskets, but most of what they had dated to the 18th century. For instance, the cannon guarding Canton couldn’t be aimed and some of their muskets required two men to aim and fire them. 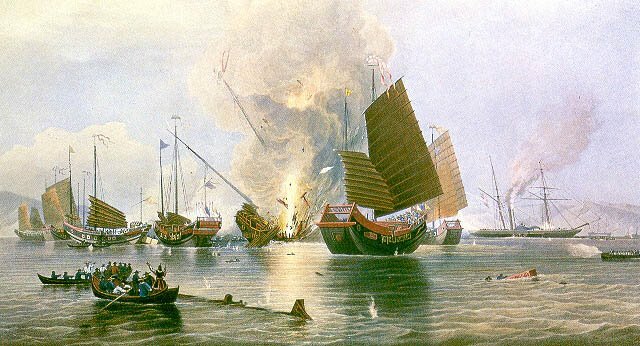 The Opium War marks one of the first uses of iron clad steam-powered warships in battle. These sections read like missing chapters of Jared Diamond’s Guns, Germs, and Steel especially when the most effective weapons against the British turn out to be biological. The invaders largely remain dependent on the Chinese for food and water and more die from dysentery than from battle, but the Chinese ironically decline to use this as a tactic because it’s too uncivilized. The book also goes into the cruel way the Chinese tortured prisoners so the reluctance is doubly ironic. 3) The Taiping rebellion, one of history’s most devastating revolutions that killed some 20 million people occurs in China between the two Opium wars. In America at roughly the same time ,there were three or four Christian offshoot religions that flourish to this day, the Mormons, the Jehovah’s Witnesses, the Seventh Day Adventists, and the Christian Scientists. It’s often forgotten that the Taiping rebellion was also nominally Christian, though it was a very radical take on the religion in that its leader claimed to be Christ’s younger brother. 4) The Opium Wars were genuinely controversial in Britain. The church did in fact oppose the war on moral grounds. Again one of the ironies is that British Church missions came to China to work with addicts and the Missions in turn were protected by British soldiers who had, of course, been the instrument for spreading opium through China. The first vote in parliament was very close. The authors also point out that England had an Opium problem of its own mostly among factory workers in the form of laudanum, an opium derivative. Gladstone’s own sister died from the effects of opium addiction. Chiang Kai Shek uses opium and later heroin as a way to finance the Nationalist government. The book mentions in passing that Mao may have led history’s only truly effective war on drugs. Right wingers might be pleased to learn that he executes dealers, develops effective rehabilitation methods for addicts although the effectiveness is bolstered with prison and execution for those who fall off the wagon. On the other hand, they’d have to admit that the ideas came from Mao and not say that paragon of will power, Rush Limbaugh or say George W. Bush whose Dad used to be called “Poppy” :}. The poppy continues to play a fascinating role across Asia including the ambivalent role of the U.S. in the Taliban’s activities in the heroin trade out of Afghanistan over the last twenty five years. 6. One persistent thread in the book is the devastating impact of faulty intelligence. Throughout the wars, Chinese generals and bureaucrats anxious to look good to the Emperor exagerrate their successes and cover over the depth of their failures in the field. The result is that China persists in strategies that don’t reflect reality and the disaster is worse than it might have been for the Manchus as it may be for the US in the Middle East. What I would have liked to see more of. Perhaps the sources simply didn’t exist, but there’s very little in the book about the impact of the opium trade and the wars on ordinary Chinese. As mentioned above, if the authors used Chinese sources most tend to be the texts of Imperial edicts, etc. One of the few scenes of the hardships caused by the looting is of a Mandarin official whose family is first robbed by European, Sepoy, and Sikh soldiers who then manages to find a small amount of food for his wife and children only to have it stolen by Chinese bandits. The use of the sacking of the Imperial Winter Palace as a framing device makes for some great imagery. There’s a colorful scene where the Europeans are met by dozens of Eunuchs shouting to them not to destroy the treasures. By presenting Lord Elgin’s destruction of one of the great collections of Chinese art, books, etc. as the symbolic atrocity of the wars, the writers choice undercuts the thousands of deaths and suffering actually wrought by the English and eventually the French in the two wars. The cost in lives and resources is detailed, but these never receive the same level of description as the Winter Palace. One result is that the Manchu rulers come off as the “victims” rather than the Chinese people. The book is intended as a history, but early on does try to draw some parallels between British colonialism and the current American Empire. While it may have been outside the scope of what they intended to do, I regretted that the authors didn’t spend a chapter or two discussing the way the Opium Wars still impact Chinese-western relations (somehow China can’t feel too guilty about flooding the US with cheap goods and taking away American jobs with our addiction to inexpensive shopping) and resonate with modern foreign policy where real politik gets draped in moral outrage. One of the juicier parallels to our world is that Chinese mistreatment of British emissaries and prisoners is used to justify the Opium War to the British public through the early newspapers. The authors note that Britian’s cynical use of war wound up being hugely successful in sustaining the Empire. The choice between a culture’s economic vitality and its soul gets trumpeted on the book jacket and in the preface, but the book actually never explores its consequences and impact with much depth. At roughly the same time, Commodore Perry forced Tokugawa Japan open to the west. Unlike China perhaps because opium did not play a role there, the Japanese were able to industrialize in 50 years well enough that they were able to defeat the Russians n the Russo-Japanese war at the turn of the 20th century. Fascinatingly, it is the British who play a key role in helping the Japanese develop modern factories and battleships. Again, this may have been outside the scope, but I would have loved to seem some discussion of the contrast. Finally, despite the attempts to enliven the book with “characters” and anecdote, much of the book bogs down in numbingly interchangeable descriptions of the military campaigns themselves. I imagine these keep it feeling like history, but as narrative for a popular audience I would have settled for a summary description of the military portion in exchange for more detail about the social and cultural impact of the war in both countries. The authors are also big on lurid descriptions of torture during confinement. This may have something to do with the available documentation since these incidents were played up in the western press of the time, but they detracted from the more overarching historical points. It’s a question still worth asking about the current players on the world stage. Wow, nice summary of the book. I've always found the Opium Wars one of the more fascinating aspects of European Colonialism. So many people dwell in the sheltered belief that Europe and America were always noble in all their wars and colonial conquests, but the Opium wars, imho, certainly counter that conservative view. I don't know that it's a conservative view to believe that colonialism was more benevolent than it was. I should mention that the book hardly makes a one-sided case in that the Manchus come off quite poorly as well. I do think those who don't understand why the Middle East and Latin America have often distrusted Anglo-American motives need to take a closer look at the track record. You can't simply proclaim yourself as the "bringers of freedom and democracy" when you haven't necessarily been that in the past. Sane Asylum -- We need a place for the dwindling sane to retreat to. I hope the sane don't have to be in retreat. I have to say though that Manchu China sounded a bit like the United States in the book. Well, I called it a conservative view because traditional conservatism does not like change nor does it like anything to be different. Part of the sustaining belief behind colonialism was that colonies would "civilize" "uncivilized" people. Of course, they called others uncivilized because they were different. By making other people in other countries more like us, the belief goes, the more those people would benefit from the wisdom of the colonists. That, in turn, would make the rest of the world more like "us," which is a conservative view of how the world should be. Anyway, quote Laurel and Hardy, "That's our story and we're stuck with it." Is Laurel and Hardy they Republican ticket for 2008 or was that 2004? Thank you, Chance, for such a thorough reading and review of my book. -- Frank Sanello, co-author, "The Opium Wars: The Addiction of One Empire and the Corruption of Another." wow, what a pleasant surprise! Thanks for reading the review. I look forward to reading any future books or articles you have in the works.